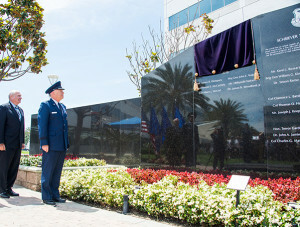 Lt. Gen. John F. Thompson, commander of the Space and Missile Systems Center, addresses family members and civic leaders from the surrounding South Bay beach cities in attendance to honor six new Air Force and civilian space pioneers, whose names are newly inscribed on a wall of polished black granite at the General Bernard A. Schriever Memorial, located on the grounds of the Space and Missile Systems Center at Los Angeles Air Force Base in El Segundo, Calif., May 14, 2018. Six early Air Force and civilian space pioneers were honored during a ceremony held June 14 to unveil their names, newly inscribed on a wall of polished black granite at the General Bernard A. Schriever Memorial, located on the grounds of the Schriever Space Complex at Los Angeles Air Force Base, Calif. Hosted by Lt. Gen. John F. Thompson, commander of the Space and Missile Systems Center, and sponsored by the Schriever chapter of the Air Force Association, more than 200 attendees, including family members and civic leaders from the surrounding South Bay beach cities honored the six new inductees: James R. Dempsey, Maj. Gen. John “Jack” E. Kulpa, Jr., Lt. Gen. Forrest S. McCartney, Hideyoshi Nakamura, Col. Albert John “Red” Wetzel, and Dr. James B. Woodford, Jr. Many of the inductees’ family members and representatives were lauded by Thompson in the Schriever courtyard where the nine-foot-tall statue and wall of honor is located. Among those accomplishments, Thompson pointed out to the audience, were the Gemini, Apollo, and Space Shuttle programs, ballistic missile defense, Atlas, Titan, Minuteman, and Peacekeeper ICBM programs, the Global Positioning System, and satellite reconnaissance and surveillance. Retired Maj. Gen. Thomas Taverney, chairman of the board of the Schriever chapter of the Air Force Association and former vice commander of Air Force Space Command, also took time to address the family members on the significance of their honoree’s accomplishments. 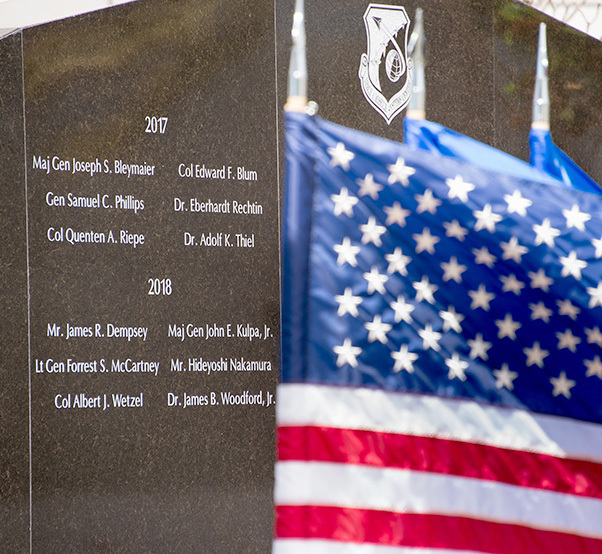 Six newly inducted Air Force and civilian space pioneers are inscribed on a wall of polished black granite at the General Bernard A. Schriever Memorial, located on the grounds of the Space and Missile Systems Center at Los Angeles Air Force Base in El Segundo, Calif., May 14, 2018. Taverney encouraged the audience to take the time and learn more about the space pioneers whose names are inscribed on the Schriever Wall of Honor. “For the people of tomorrow, you face a challenge almost equally as daunting. It’s a different challenge. It’s a challenge you can see if you read up on all the men who are being inducted this year. You’ll see they were all agents of change. They never felt tied down by what happened before, or what had worked. If they thought something could be better, they did it, and that’s why we were constantly improving, because they didn’t settle for the status quo,” said Taverney. Lt. Gen. John Thompson, commander of the Space and Missile Systems Center, and retired Maj. Gen. Thomas Taverney, chairman of the board of the Schriever chapter of the Air Force Association and former vice commander of Air Force Space Command, watch as six newly inscribed names of Air Force and civilian space pioneers are revealed during the 2018 Schriever Wall of Honor induction ceremony at Los Angeles Air Force Base in El Segundo, Calif., May 14, 2018. A P-38 reconnaissance pilot in Europe during World War II, James R. Dempsey remained in the Air Force after the war and pursued higher engineering degrees at the University of Michigan. He served as chief of projects in the Guided Missile Directorate, U.S. Air Force Headquarters, and later as chief of projects and operations officer with the U.S. Air Force Missile Test Center at Cape Canaveral, Florida. In 1953, then-Col. Dempsey was identified by government insiders as an ideal managerial candidate for the Atlas intercontinental ballistic missile program. Convair subsequently selected Dempsey for the role, which required him to leave the service. The massive Atlas project encompassed 30,000 employees and another 60,000 subcontractors. Although it saw only brief service as an ICBM, Atlas became the basis of a space launch vehicle family that remains in operation. Early successes included the first successful use of Atlas as a launch vehicle for Project SCORE (Signal Communication by Orbiting Relay Equipment) and its later adaptation for early manned spaceflight with the Mercury and Gemini programs. In 1965, Dempsey was named president of Convair. He departed for the Avco Corporation the following year, becoming vice president of its Government Products Group, where he stayed until 1975, overseeing flight of the company’s heat shields for the Apollo spacecraft and Minuteman re-entry vehicles. Thereafter, he served on the boards of several corporations and mutual funds until retiring in 1994. Maj. Gen. John “Jack” E. Kulpa Jr.
A graduate of the United States Military Academy at West Point, Maj. Gen. John “Jack” E. Kulpa, Jr. graduated in 1950 with a bachelor’s degree in military engineering. After flight training, he completed multiple assignments to reconnaissance and bomber units worldwide. He subsequently earned a master’s in aeronautical engineering from the Air Force Institute of Technology in 1957. Following completion of Air Command and Staff College in 1963, Kulpa joined Space Systems Division at Los Angeles Air Force Station as a project manager. In 1965, he was named the second system program director for the Defense Meteorological Satellite Program. He later commanded the Air Force Avionics Laboratory, and served as deputy for engineering at Aeronautical Systems Division. The general was subsequently assigned to the Office of the Secretary of the Air Force in Washington, D.C., as deputy director, Office of Space Systems, before becoming its director in 1973. Following a tour as principal deputy for plans to the deputy director of the CIA, he was named the director of special projects, Office of the Secretary of the Air Force, in 1975. He assumed the duties of deputy commander for space operations in 1980. In that capacity, Kulpa oversaw the Department of Defense components of the first Space Shuttle missions before retiring from service in April 1983. Lt. Gen. Forrest S. McCartney received a bachelor’s degree in electrical engineering from Alabama Polytechnic Institute in 1952 and received his commission as a distinguished graduate of the school’s Air Force ROTC program. After earning a master’s degree in nuclear engineering from the Air Force Institute of Technology in 1955, McCartney served as a project officer at the Special Weapons Center, Kirtland AFB, N.M. In 1959, McCartney joined the newly-formed Satellite Control Facility at Sunnyvale, Calif., as a satellite controller. He subsequently worked as a project officer on the Titan III program at the Office of Space Activities, Headquarters Air Force Systems Command at Andrews AFB, Md. He was eventually assigned to the Space and Missile Systems Organization at Los Angeles Air Force Station in 1974, where he served as the Air Force Satellite Communication Systems program director, Fleet Satellite Communications Systems program director, and the deputy for Space Communications Systems. McCartney moved to Norton AFB, Calif., in 1979 as vice commander of the Ballistic Missile Office. He assumed command of BMO and directorship of the MX (Peacekeeper) ICBM program the following year. In 1982, McCartney was named vice commander of the Space Division, and in 1983, he assumed command of Space Division and served as vice commander, Space Command. Upon activation of U.S. Space Command in 1985, he was redesignated commander of the Space Division until his retirement in August 1987. As director of NASA’s Kennedy Space Center, he led KSC personnel through tumultuous times after the space shuttle Challenger accident – and through the successful return to flight of the space shuttle Discovery in 1988. With bachelors and master’s degrees in mechanical engineering from the University of Minnesota, Hideyoshi Nakamura initially joined The Aerospace Corporation in June 1961 as a member of the technical staff in the Propulsion Department, Systems Research and Planning Division. He had previously worked for General Dynamics/Convair as a senior group engineer, and for NASA’s Lewis Flight Propulsion Laboratory as a research scientist. He held a number of positions at Aerospace, including directorships of the Data Systems Office, Subsystems Office, and Advanced Concepts Office. He also served as senior engineer, and later senior director, of the Plans and Systems Architecture Office. In 1968, Mr. Nakamura co-authored the Navigation Satellite Study with James B. Woodford, Jr. The publication, which came to be known as the Woodford-Nakamura Report, explored concepts and architecture that ultimately led to the development of the Global Positioning System. Col. Albert J. “Red” Wetzel graduated from Tulane University in 1939 with a bachelor’s degree in electrical engineering and was called to active duty the following December. Wetzel completed pilot training and subsequently served as a project officer and test pilot in the Special Weapons Branch of Materiel Command at Wright Field, Ohio. He earned a master’s degree in aeronautical and astronomical engineering from Johns Hopkins University in 1950. After several years of contemplating missile and space-related topics, Wetzel directed the Titan ICBM program from its concept stage to operational readiness. His leadership resulted in the decision to make a complete configuration change for Titan II, rather than rely on incremental changes in Titan I. Improvements in Titan II led to its successful use as a launch vehicle for the manned Gemini program and enabled the development of future heavy-lift configurations associated with Titan III and Titan IV. Wetzel subsequently served as executive assistant to the commander of Ballistic Systems Division; executive director of the Air Force Council; and director of Strategic Programs in the Office of the Under Secretary of Defense for Research and Engineering. He retired from active duty in 1965, but remained a contributor to the Rocket and Space Panel of the President’s Science Advisory Board until 1971. Dr. James B. Woodford, Jr.
Dr. James B. Woodford, Jr. received his bachelor’s, master’s, and doctorate degrees in electrical engineering from Carnegie Tech in 1948, 1949, and 1950. Prior to joining The Aerospace Corporation in 1960, Dr. Woodford was associated with Space Technology Laboratories as staff engineer in the Advanced Systems Planning Division. He entered industry from academia after serving as associate professor of electrical engineering and assistant department head at the Carnegie Institute of Technology. Woodford held a number of positions at The Aerospace Corporation, including associate group director of the Navigation-Communications Systems Directorate, associate group director of the Advanced Orbital System Directorate, and principal director of the Government Support Division. In 1968, Woodford co-authored the Navigation Satellite Study with Nakamura. Known as the Woodford-Nakamura Report, the publication explored concepts and architecture that ultimately led to the development of GPS. 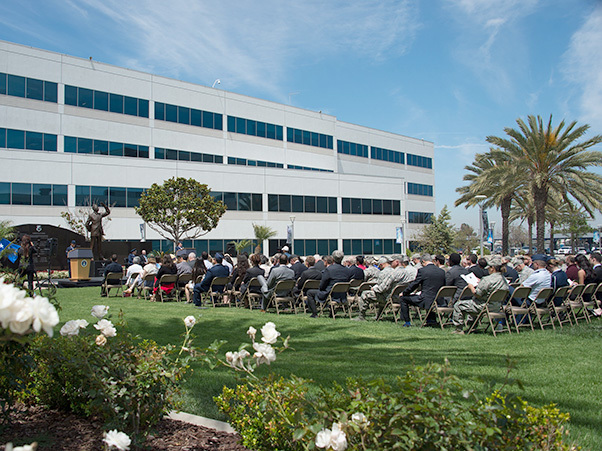 More than 200 attendees, including family members and civic leaders from the surrounding South Bay beach cities honored six new Air Force and civilian space pioneers, whose names are newly inscribed on a wall of polished black granite at the General Bernard A. Schriever Memorial, located on the grounds of the Space and Missile Systems Center at Los Angeles Air Force Base in El Segundo, Calif., May 14, 2018. 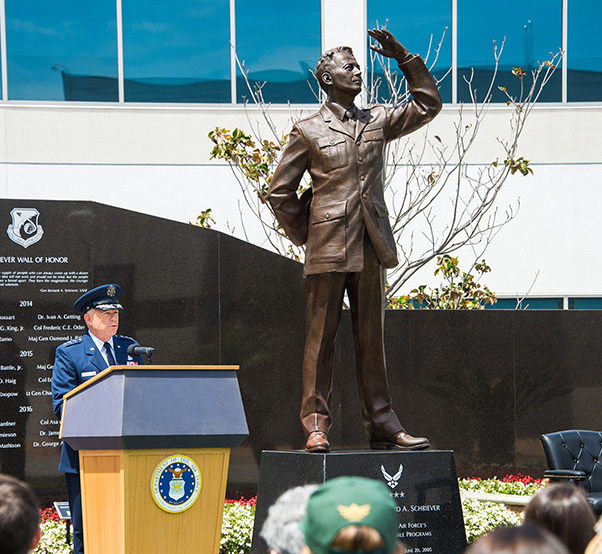 In November 2007, the Air Force Association’s Schriever chapter commissioned and sponsored a nine-foot-tall statue of Gen. Schriever, sculpted by renowned artist Eugene Daub, best known for his portraits and figurative monument sculpture created in the classic heroic style. With support from industry partners, the 60th anniversary of SMC in 2014 was chosen as the initial occasion to recognize some of the Air Force’s earliest space pioneers who made tremendous contributions in their field. Additional pioneers are chosen each year to have their names added to the Schriever Wall of Honor.